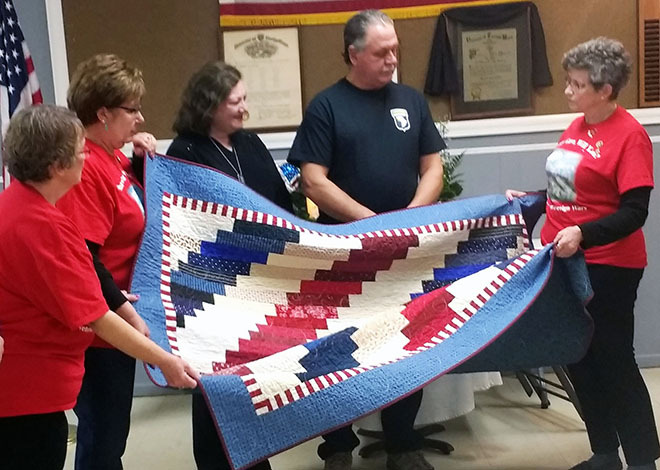 Members of the Roscoe VFW Post 2955 Auxiliary presented a hand-made quilt to Wendy and Rick Boroski during a memorial program held at the VFW Post, Sunday, March 31. Wendy is the mother of Brandon Rowe who was killed in Iraq, March 31, 2003. The quilt was made and donated by members of Roscoe Quilts of Valor. Sixteen members of Rowe’s unit attended the memorial in honor of their friend and comrade. It’s been 16 years since Army SPC Brandon Rowe of Roscoe and a graduate of Hononegah High School died fighting in Operation Iraqi Freedom. Rowe was killed in action on March 31, 2003. He was 20 years old. He was the first soldier in the 101st Airborne Division fighting in Iraq, to lose his life. Rowe lives in the hearts of his family and many of his comrades. In honor of the anniversary of his death, Veteran Ed Suchoski -VFW Post 2955, and also a member of the 101st Airborne Division, coordinated a memorial program and luncheon prepared by the VFW Auxiliary. 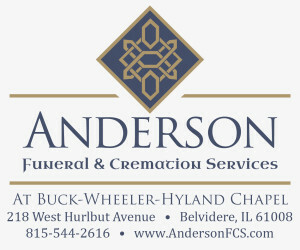 The memorial was held on Sunday afternoon, March 31, at the VFW. Special guests were Rowe’s mother Wendy and step-father Rick Borowski. Forty members of Rowe’s unit have kept in touch through the years. About 16 of them made the trip to Roscoe to honor the memory of their friend and comrade. Nick Mizer came from Indianapolis, Chris Morrison, from Mattoon, Ill. Morrison has set up a Facebook page as a way to stay in touch and communicate with his unit. Retired Colonel David R. Draeger, Rockford Public Schools Senior Army Instructor began the program with an opening prayer. Five members of the Auburn High School JROTC Academy Color Guard: Michael Lebrecht, Brittany Connor, Jacob Brendum, Miguel Concepcion and Joel Mendoza presented colors. Auxiliary officer Kathy Suchoski presented a red, white and blue hand-made quilt to the Boroski family. The patriotic quilt was made by members of Roscoe Quilters of Valor. At the end of the program, everyone joined hands and sang “Proud to be an American” in honor of Rowe and the fallen heroes of war.